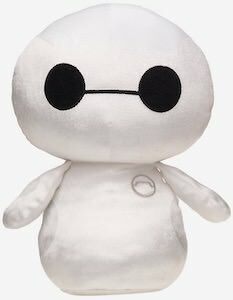 Now all the Big Hero 6 fans can have there own Baymax Plush. This Baymax is 12 inches tall and is adorable just like the real Baymax in the Big Hero 6 movie. This plush does not have legs so you never have to worry that it runs away if you didn’t cuddle it enough. A cute plush likes this makes for a fun present for everyone that really could use a cuddle friend in their lives. Now you can own a healthcare companion that will not deflate as it is soft and cuddly and super fun. 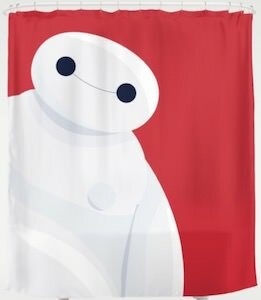 If you need a shower and want to have a cool curtain in the tub then come check out this Baymax shower curtain. The Big Hero 6 character can be found on this shower curtain and the shower curtain has a red background with on top of it a giant picture of Baymax. The Big Hero 6 shower curtain is 71 x 74 inches and is white on the back and can be machine washed. Adding the friendly looking Baymax to your shower just makes it look so much more fun to be in your bathroom. No longer do you have a boring shower curtain because Baymax can make it way more fun. 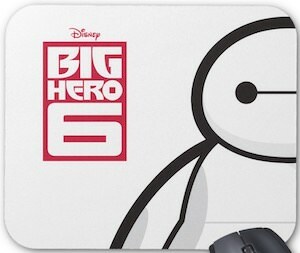 If you need a power bank and you like Big Hero 6 then you have to check out this Baymax power bank. The power bank comes in two colors and it looks like a milk bottle and it shows the face of Baymax on it and he is dripping some milk from his face and below it you find the text “Milk”. The Big Hero 6 power bank is 10.000mAh and has two 2.1amp USB ports for charging on top so that you can charge your phone, tablet, and other usb device and as the battery is nice a big you can charge lots of things. The Baymax power bank comes in with a charging cable and a carry pouch. If you would like a fun t-shirt and you like Baymax then you just need this Baymax face t-shirt. 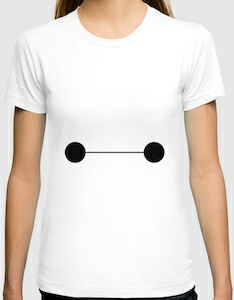 The famous big Big Hero 6 character can now be found on this t-shirt but it is not as clear as many would think as it just looks like a white t-shirt with a line and two black dots but then if you think a bit closer that is all you will see on Baymax face and that almost makes this into a Baymax costume t-shirt. You can get this white t-shirt in style for both men and women and it is available in long sleeves too and it is available in many sizes. Now there is a women’s Baymax dress for all the Big Hero 6 fans that want an amazing looking dress that reminds them off the adorable Baymax. The women’s dress is made from 95% cotton and 5% spandex and is dark blue with a white waistband. The Baymax dress is sleeveless and has a fun cutout back. A dress like this is great for so many occasions, it can be worn more formal but also as a fun dress for summer. If you are looking for a fun white baseball cap then you have to check out this Baymax cap. The Big Hero 6 hat is white and is adjustable in size. On the front of the white snapback hat you can find the eye’s of Baymax and on the side, you can find a picture of Baymax himself and on the back just above the size adjuster you can find the Big Hero 6 logo in red. 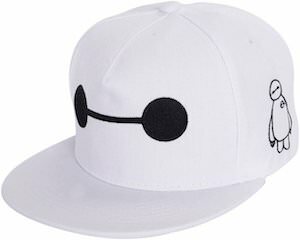 So if you like a nice white hat that is also related to Big Hero 6 then wearing this baseball cap is just what you want all thanks to Baymax. This Baymax plush is something every Big Hero 6 fan needs. The plush is part of the Funko Fabrikations series and has number 24 on the box. The plush Baymax looks just like the real Baymax did in the Big Hero 6 movie only a whole lot smaller so that you can cuddle with it whenever you want. And Baymax is not a little kids toy, it is rated ages 14 and up. The Baymax plush has a rotating head so that he can look where ever you want him to. 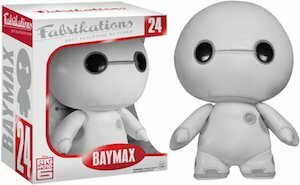 And Baymax comes in a nice box to that you can keep as his little home for when you are not playing with this adorable Big Hero 6 star.